Here are two more reasons why Michigan and the American Midwest are slipping to backwater status in the United States, and why we can’t give up on the capacity of our governor and state lawmakers to help work Michigan out of its economic mess. Fact one, according to a new analysis by the Metropolitan Policy Program at the Brookings Institution: Six of the 80 old industrial cities lagging far behind in economic performance, population growth, job creation, and business development are in Michigan. All but 17 of the 80 underperforming cities in the United States, according to the Brookings findings, are in the Midwest, Mid-Atlantic, or New England. Fact two. Michigan’s residents are starting to give a lot more thought to struggling cities as fuel prices climb past $3.50 a gallon, as they did this week. The old rules about where the most affordable housing lies — far from the city center — no longer applies if it costs $12 a day in after tax income to commute for a working person who earns $70 a day. For every dollar a family thinks it saves in monthly housing costs by moving to the far outer suburbs, according to the Center For Housing Policy in Washington, D.C.,it spends nearly a dollar more in transportation costs. In other words the cost of commuting is about to exceed the savings from buying a home distant from job centers. Michigan needs it cities because people need cities to become choice places to live again. The old pattern of development — flinging people across the landscape, putting them in cars, and then tying them together with expensive roads — just doesn’t fit the new market signals of this century. Anyway you look at it, we can’t afford the lifestyle. It’s not just in Michigan. The combination of rising energy, land, and housing costs, and the decline in real wages, is prompting more people to reconsider where they buy a home. Some states — notably Utah, Texas, New York, Oregon, Tennessee, South Carolina, North Carolina — anticipated the abrupt market transition and significantly improved their cities as places to live and do business. Central city populations are rising dramatically all across the country, as are housing prices. But Michigan and much of the Midwest, according to Bruce Katz (see pix), vice president of Brookings and director of the Metropolitan Policy Program, are not keeping pace. The reason, he says, is that Midwestern states treat cities “as deficits not assets,” and allowed them to deteriorate. For the most part — with a few exceptions like Ann Arbor, Grand Rapids, Chicago, Milwaukee, Madison, and Columbus — Midwestern cities ceased decades ago to be competitive places to raise families. The result is that working people are becoming marooned in suburban and exurban homes they can ill afford, far from jobs they aren’t certain of keeping, and paying more every day to survive with wages that are static or declining. Michigan is at the head of the national pack in the number of young people and young families that are leaving to seek fortunes in more competitive places. And recruitment officers in every major Michigan city describe the hardships they experience in attracting young talent to settle here. 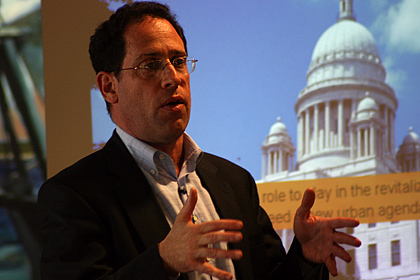 Katz was in Michigan this week, exploring his group’s new Restoring Prosperity report, and telling audiences in Lansing and Flint that Michigan should look to its cities — not suburbs, not exurbs, not rural regions — as its most important economic assets. Nationally, he said, cities are emerging as the great incubators of new economic policy, housing, neighborhood development, and wealth because they are much more responsive to the new market and demographic trends reshaping the country. The country is growing older. Households with one or two people now far outnumber families with children. The number of immigrants is climbing. These demographic trends favor cities. Couple that with rising energy and land costs, and the desire by more people to move out of expensive, congested, and increasingly unsafe suburbs, and the future of cities in America is bright, he said. To some extent, Katz said, Michigan’s cities reflect those trends. Downtown Grand Rapids, Ann Arbor, and Traverse City are attracting new investment and housing. But much more opportunity exists in urban development, he said, and the state has an essential role in deciding where it should spend money to encourage metropolitan prosperity — for rapid transit, parks, housing, job investment strategies, neighborhood development — and where it shouldn’t, such as providing thousands of acres of state land and subsidizing a giant theme park in rural Roscommon County.